Contra, the start of a very long and great series. Contra is the kinda game you can sink your teeth into. Guns, explosions, aliens, and most importantly, lots of killing. 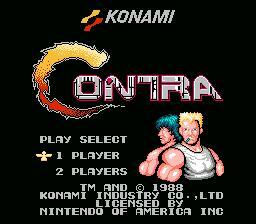 That's what a true game should consist of, and that's what Contra is all about. The graphics were great, which is something you can always expect from Konami. The music is catchy and the sounds are realistic, except for the sound it makes when you die. This is a great game for you and a bud, or just save the world by yourself. So have some fun, kill some aliens, thanks to Contra. Choose one or two players. If you choose one, it's you against a world of badguys. If you choose to play with a friend, you will go for the glory together. If one of you dies, you can borrow an extra man from the other by pressing B. Most of the levels are a side-scrolling shoot'em up. A few, however, are shown from behind the heroes, and you must shoot forward at the enemies while dodging incoming fire. And one is shown the same as the side-scroller, except you're going up to climb the mountain. Make your way to the end of each level by killing baddies that get in your way. At the end of each level you will have to beat a boss. Each boss will require a different strategy to beat. It's usually a large alien, or a base to infiltrate. Power-ups can be found by shooting red Falcon insignias. The only power-ups that are not weapons are the bulletproof (B), that makes you invincible for a short time, and the Flashing Eagle that will destroy all the enemies on the screen. The weapons are: a machine gun (M), a flame-thrower (F), a laser (L), spread-fire (S), and rapid-fire (R) that will make the shots from any weapon go faster. Remember that getting hit one time will kill you, so if you're not careful, you'll go through extra men very quickly. At the Title Screen press Up, Up, Down, Down, Left, Right, Left, Right, B, A, Start. At the title screen, hold the D-pad up-left along with the Select and A button, and push Start.